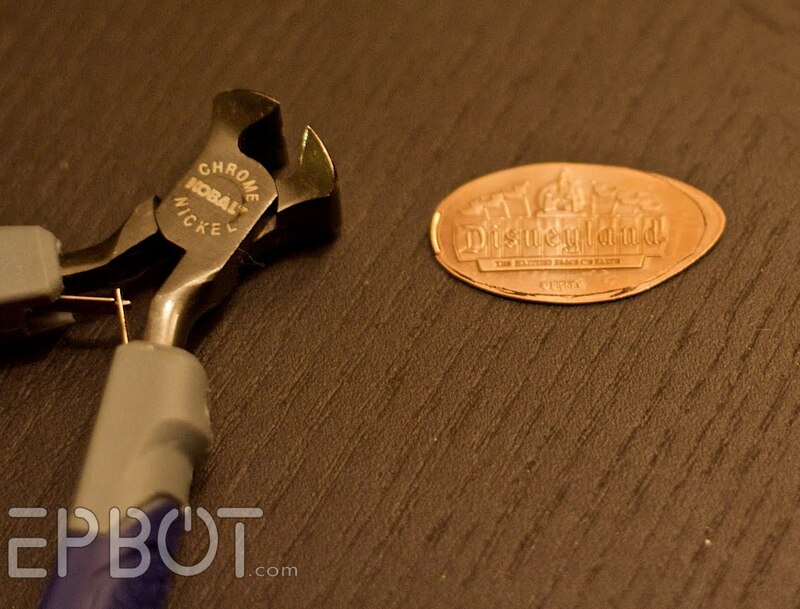 1) Drill a tiny hole in penny/smashed coin. 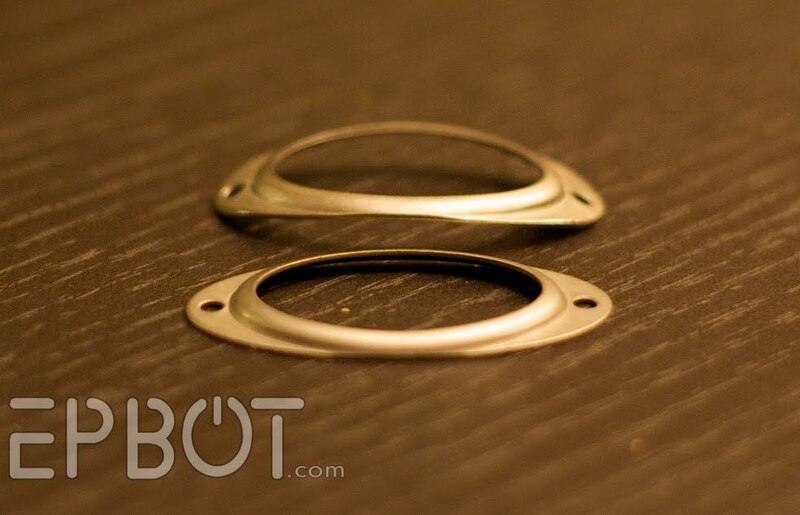 2) Insert O ring into hole. 3) Voila! Instant smashed penny charm! 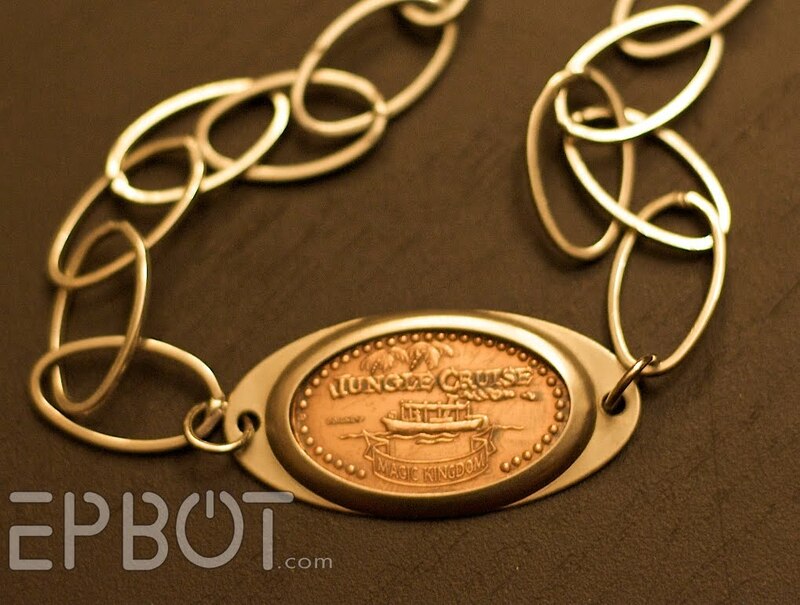 The dime is just a bit shorter than a smashed penny, so it works well for a bracelet dangle. To drill such a small hole, you really need to get your hands on a Dremel . You'll also need a special attachment for the Dremel to hold the teensy tiny drill bits, which costs about $10. Now, if you're not very comfortable with power tools, don't worry: the Dremel is super easy to use, and will most likely become your gateway drug into bigger and scarier Toys That Make Noise. Trust me. Thank you, clearance! Both of these were 40% off at JoAnn's. 3) Voila! A smashed penny charm! I've actually had this penny since I was a JC skipper, so it means a lot to me. In fact, trying to find a way to turn it into a necklace is what led me to these silver scrap booking ovals in the first place. Now it's one of my favorite possessions. If you're going to do a similar design to this, I highly recommend getting a second penny oval and putting the two back to back. (The charm tends to flip over when you wear it.) 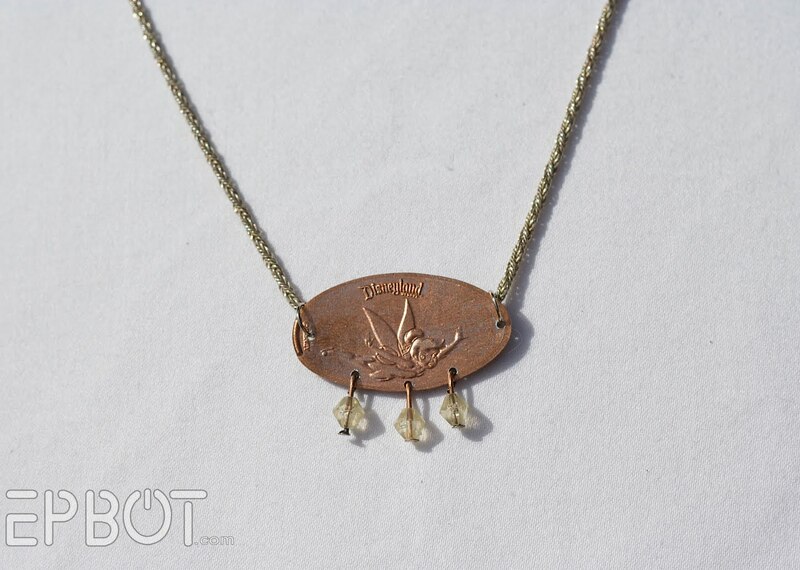 I just recently added a Tiki Room penny to the back of this necklace. No need for glue; just use the O-rings to hold them together. You'll need a fine-tipped Sharpie or other marker to trace onto the coin. 2) Next, using flat-nosed nippers (see above photo) CAREFULLY snip off the excess metal. 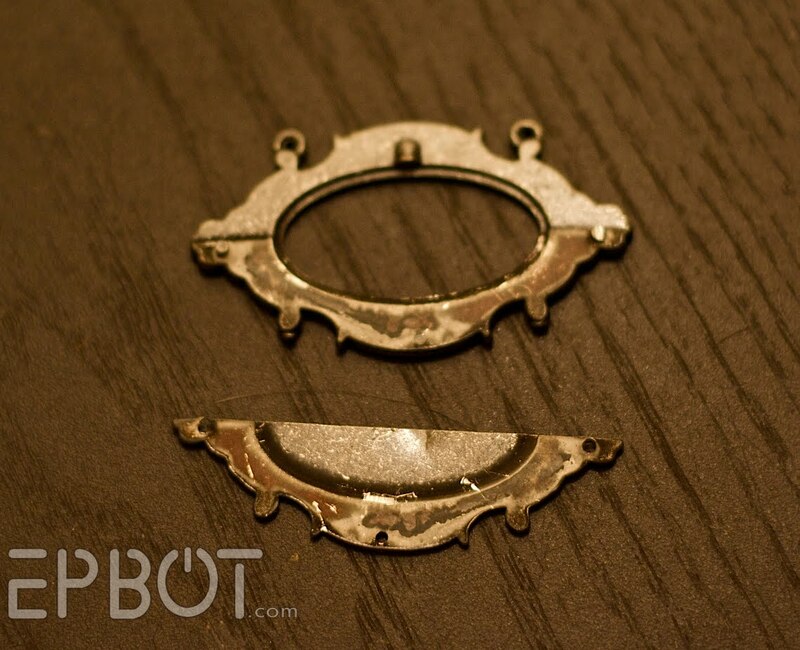 Wear safety glasses, please; the little bits of metal tend to go flying like stubborn toenails. Sorry - I was just distracted by a mental image of angry toenails with wings. Um. Anyway. You know what I mean. 4) Now see if your penny fits in the frame. Odds are, it won't. 5) When you're happy with the fit, dab small dots of super glue (or Gorilla glue, which I like a bit better) on the back seam. Spread the glue with a toothpick, checking to make sure it's not visible from the front. This is one of the larger scrapbooking ovals. I have a hunch a smashed quarter might fit in it, so I'm saving this piece until I'm out at the parks next to snag one. As you can see, the frame's holes line up perfectly with the belt notches - a nice bonus, since that means no drilling to get the brads through. I'll add more brads to the two remaining holes for decoration. So, to make the penny bracelet, you'll need another piece of belt - no holes - that's long enough to fit your wrist with about a one-inch overlap. 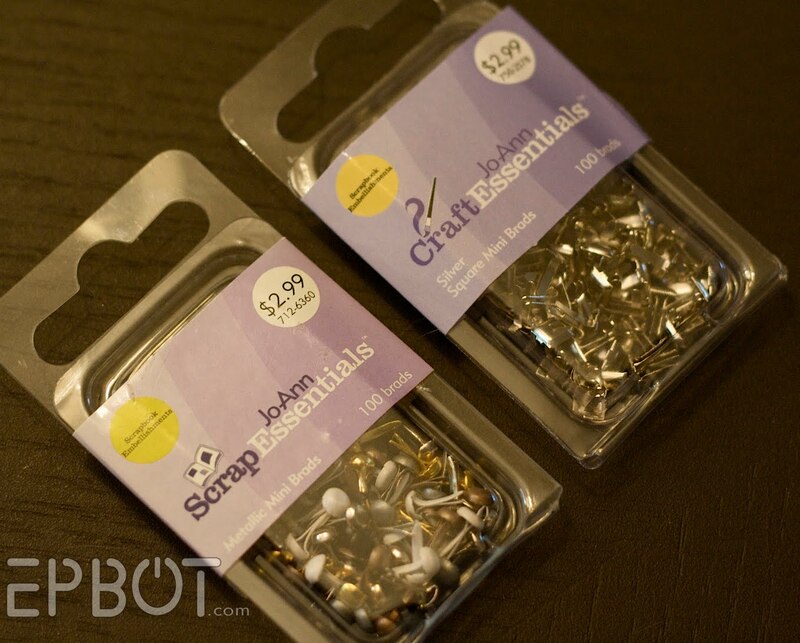 Use a snap kit (available at any craft store) to hammer on a snap closure - or you can use Velcro or magnets or toggle buttons or any other snappy solution your crafty little heart desires. Both the frame and penny are pretty thin, so you may be able to bend them using just your hands. (I needed John's help.) Try pressing them over a soup can to get a nice, even curve. This is quite tight, but you can also add a dollop of super glue over the brads for extra security. Because the ends are bent down into the leather/vinyl, though, you won't have to worry about them scratching your arm. 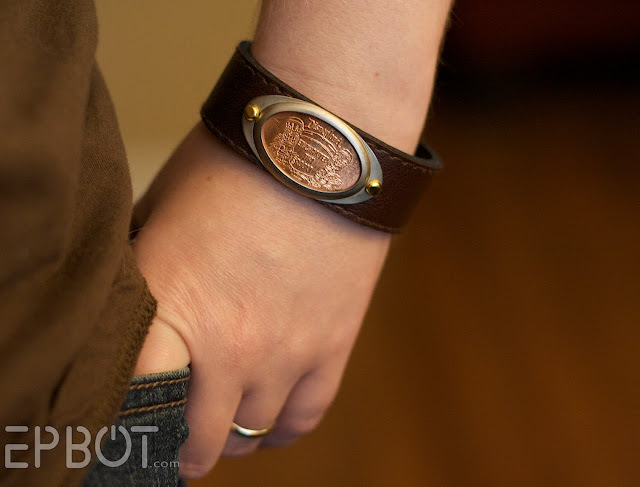 If you're feeling industrious, there's actually enough room on this cuff to add two more penny frames on either side. Personally I like it with just the one, but feel free to experiment and see what looks good to you. Oh, and here's something I should have mentioned at the beginning but forgot to so I'll just cram it in here: Before you go gluing your pennies into frames, decide if you want them polished or not. If so, then you'll need to both polish and clear-coat them ahead of time. 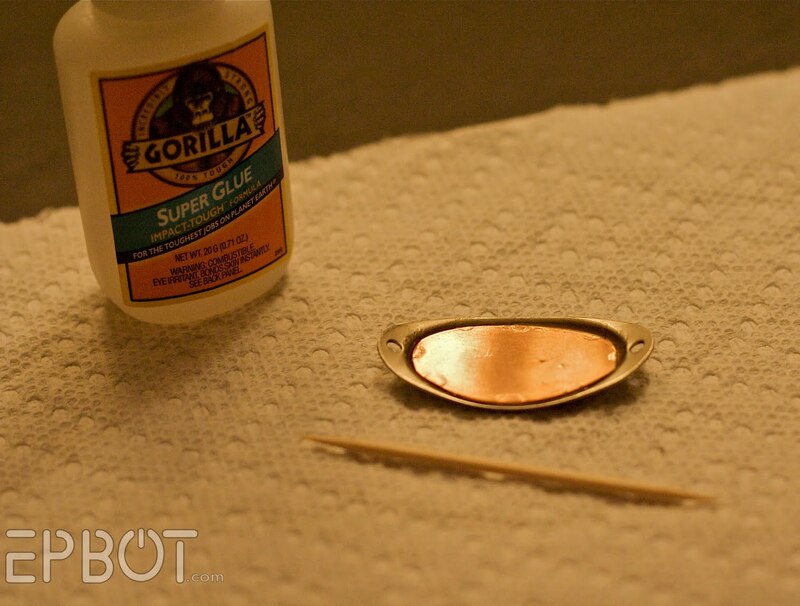 I use a simple brass polish, and then a spray lacquer. If you like the patina of your penny as-is, though, then never mind. Glue at will! I originally intended to link this penny into a chain on either end, but I haven't found a chain I like for it yet. As you can see, you can still string it on a necklace using O-rings this way, but it does look a bit odd up close. The options with dangling beads from the penny are limitless, though: any tiny crystal or bead will work, and you can add just one accent dangle or ring the entire bottom with them. The colored beads used to be a child's stretchy bracelet I bought for a few dollars eons ago and then never wore. I figured I'd try making my own dangle beads with them, to go along with the Dumbo penny and silver necklace. I bought this pirate ship necklace on some cool Indy site, but it turned out to be cheap, clouded plastic. Boo. Now, though, it's just cute enough that I might actually wear it. I love this penny (c'mon, seahorse!! ), so I've been dragging my feet deciding what to do with it. I like how this old necklace looks like seaweed around it, but I may take off the bottom dangle - it just seems too much. It also kind of looks more like a brooch than a necklace to me. I dunno. What do you guys think? Anyway, I'll keep working, so expect another update sometime in the future! Keep the dangle. It adds to the seaweed feel of the piece. Well done turning your pile of smooshed pennies into usable memories. We can get these made from copper-zinc blanks in New Zealand, even though we don't use "pennies" as money. In fact, our lowest coin in $.10. Much more sensible and easier on the coin purse. Tinkerbell with that pirate ship is DIVINE!!!! Well done. I too got tons of stuff at JoAnn's for 40% off this week using a ton of e-mail coupons. I love that place!! 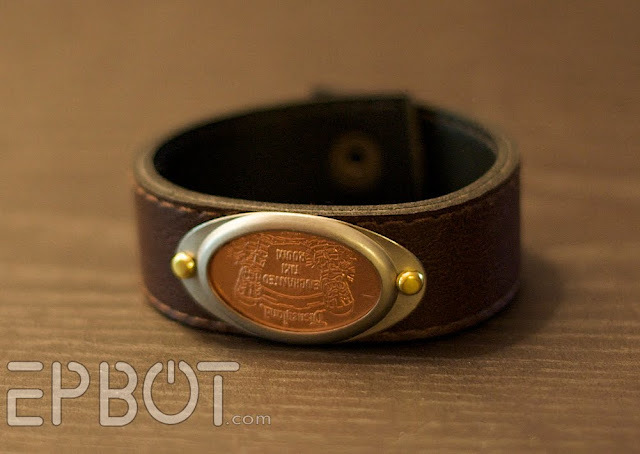 I would like to say that if you were to sell any of those (esp, like, a Pirates of the Caribbean penny leather cuff), I would be ALL OVER THAT. Just saying. Also, those are GORGEOUS. I love all you've done with the pennies. I never got into collecting the smashed pennies...what was I going to do with them? I think I ended up throwing them out, now Im sad I did. Disney changes those out all the time and back in the day I probably had some cool penny. anyway..everything looks so great, cant wait to see more. Wow, these are fantastic! I love every single option you showed! I have a bit of an obsession with these smashed pennies, I have them from just about every vacation I've been on. My husband thinks I'm ridiculous... whatever. Wait til he sees my stunning new jewelry! OMG, Sooooooo cool. I'm speechless. I wonder if I can find the smashed pennies from our trips to WDW when we were dating/honeymooning. I have no idea what happened to them! That is SO absolutely cool! I loved smashed pennies, and the kids love to crank the machine, so we've got lots that I don't know what to do with. Do you find that Gorilla super glue foams like the regular stuff? I always make a mess. Also, I've always wondered if the Dremel is worth it for crafty stuff -- my husband has a larger drill that I don't really want to mess with. Oh wow. I think I have to do this. I have so many of those pennies just sitting around in random places, and even more now that I'm back from San Diego. Must. Find. Frames. I knew there was a reason I love smashed pennies! I always keep a stash of shiny pennies in a zippy pouch JUST in case I run into one of those machines. Jen. I love you. And you're awesome ideas (but especially this). Thanks so much for sharing! 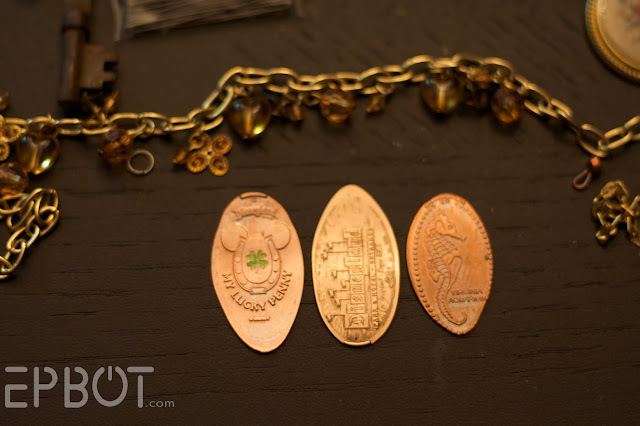 Such lovely ideas for smashed pennies! Now you have me wanting to go somewhere and get more smashed pennies for me to experiment with. These are awesome! 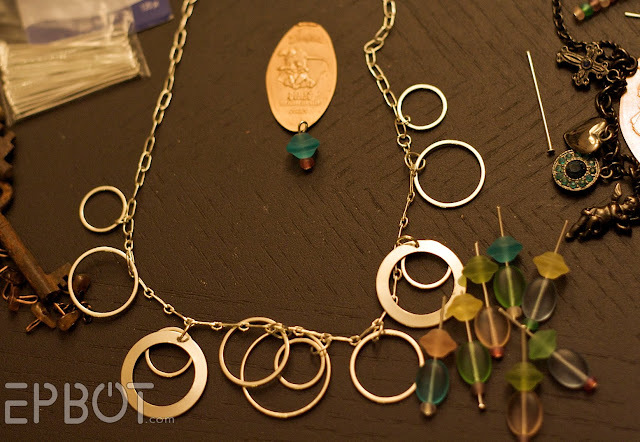 I have previously not made any of my own jewelry, but these projects have made me most interested in starting. We have smashed pennies from just about everywhere - I am envisioning a really cute bracelet from our Sea World trip. Thanks for sharing!! I am not at all creative but you are inspiring me! I always thought jewelry making had to be an expensive and involved process but it seems like your materials are cheap cheap but your final product looks really nice and polished. I don't have any disney pennies but I'm sure I can find a touristy place around here to smash pennies and experiment. Thank you for all the inspiring work, Jen! I love the seahorse necklace the way it is. I say leave it alone. The necklace with amber beads made me 'oooh!' out loud! That is fabulously pretty. And steamy. A memory just clicked for me when you said you were a skipper on the jungle cruise. I went on that ride when I was in Disneyland (at age 8). The skipper was FULL of bad puns. The whole ride. My parents were groaning the entire time. Suddenly it all makes sense. @ Ginger - Gorilla super glue is just like any other brand, but I find it to be a little less brittle, and therefore less likely to snap. They also make a super glue gel, which is less runny. @ Molly Mouse - ketchup or BBQ sauce? Really?!? Ok, I am so trying that. This is fantastic!! This blog is so awesome. Same question as Beca. Why don't you have an Etsy site or offer for sale on this site? For any of your extra pieces, of course. Favorite things are called favorites for a reason. Gonna raid my jewelry box. I still have jewelry from when I was 6 so I have tons of possibilities. Very clever. I love that you found so many ways to make charms and jewelry from souvenirs that often end up in the junk drawer once back at home. BTW, keep the Dumbo charm where it is. The copper looks cute among the silver. JMHO. For fixing unraveling ribbon or fraying fabric, you need Dritz Fray Check. They have it at JoAnn's in the notion section. Just don't squeeze too hard because it is like water before it dries. Magical! These are so cute!! OMG, I'm gonna get SO many smashed pennies when I go to Disneyworld now because I just can't wait to make jewelry like yours! Jen, you are officially the Most Awesome Person in the History of Ever. These are gorgeous! Looking at this post, it made me wonder if you have an Etsy shop, because you totally should. Leave the dangly on! ;) Gives it that little extra something. I love Dumbo and that necklace is great with all the new beads, but I personally wouldn't mix the silver and copper - maybe you could put a smashed dime in that necklace instead and put Dumbo on another and then yay! two necklaces! 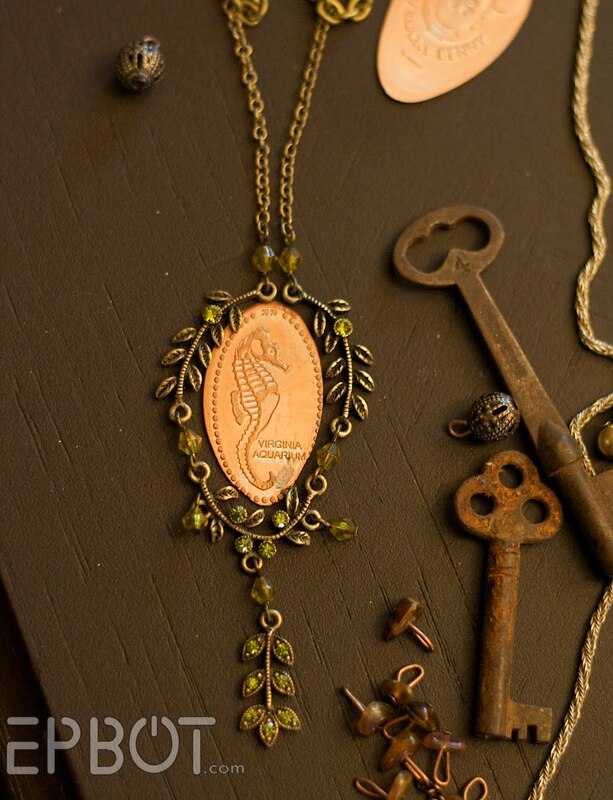 Also I like the seahorse as is and agree about the dangle - it's like the seahorse is peeking out of the top of long seaweed... but then I'm a long pendant kinda gal :-) Love those copper letters too. Oh, I really want to do this, now, but I don't think I have any smooshed pennies. I might have one or two from the aquarium years and years ago, but I don't know where they are and I haven't seen the penny machines at the aquarium when I've been there more recently. Alas! I'll just have to enjoy looking at these. I was just curious about what you would recommend as a good book to look for about jewerly making for a beginner. My mom would love to make some of this stuff, but doesn't know the know of things. awesomeawesomeawesome. I wish I had a way to smash pennies. I mean I can beat the heck out of them with my regular and chasing hammers but that's about it. Also, do the little bits of metal (or wire) make a zing! noise when they fly by your head or it that just me? ps safety glasses, I not only haz them I haz more than one pair for different things I get myself into. Good call to remind folks about these things. love the sea horse necklace... And I would leave the bottom on... I think it adds to the seaweed feel... LOVE IT! 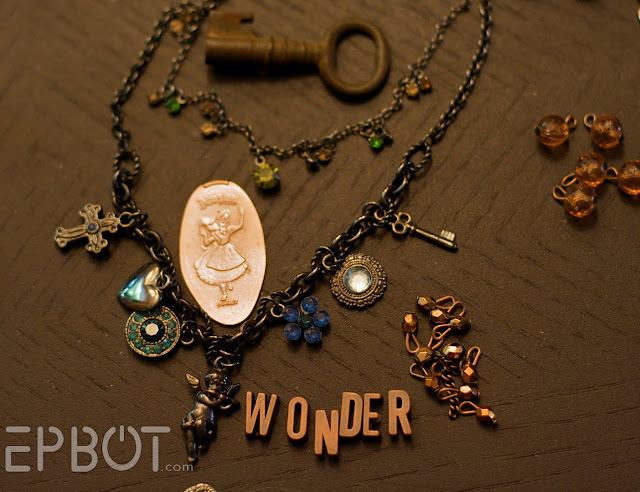 I love unique jewelry, and these projects are truly AWESOME. I love how they're girly but with a vintage feel. If only I had some smashed coins to make some with -- I used to have one from the Franklin Institute in Philly, but I have no clue where it's gotten to. I love these pieces! I love the seahorse just the way he is. And I love the black/copper combination. I have a copper bracelet that I clean by swishing it around in worcestershire sauce then rinsing in water. I think the leather bracelet is my favorite of them all. Wow wow wow! Very cool indeed! Thanks for sharing! These are great. I have some friends I'll be sharing this with. Thanks! @Jen: Just get a Q-Tip and rub the ketchup/bbq sauce on. (We usually use regular Heinz ketchup) It's amazing how much dirt you get on the Q-Tip once you're done! And don't forget to rinse off the penny when you're done! Love, love, love all of these! I'm really wishing I had a bigger/better collection of smashed pennies, creativity and time. I don't have any smashed pennies of my own, but I hang on to EVERY piece of old jewelry that I have. I'm a bit of a shopaholic too, so every once in a while I'll rummage around and add the stuff I don't wear to my hugenormous beading collection. I must add- i love love love your crafty posts. More please! oh! also- nail polish is so underrated as a crafting tool! @ Anony 3:42 - an Etsy store? Huh. Well, I *guess* I could... I go through hobbies & crafts so quickly, though, it would be a constantly changing inventory! Anyway, I'll keep it in mind if I end up with a surplus of things I'm not going to wear. @ Sari Everna - check ebay. I've seen whole lots of smashed pennies up for not much $$. @ Rhina - since this is my first foray into jewelry making, I'm afraid I don't have any recommendations for a good how-to book! Maybe someone else here does, though? Guys? I kept "oh-ing" the whole time I was reading this and my husband was highly annoyed with me ....until I showed him what I was looking at and he agrees that this post is freaking brilliant!! I'm going to be thinking about making jewelry while I'm dreaming tonight. Beautiful! 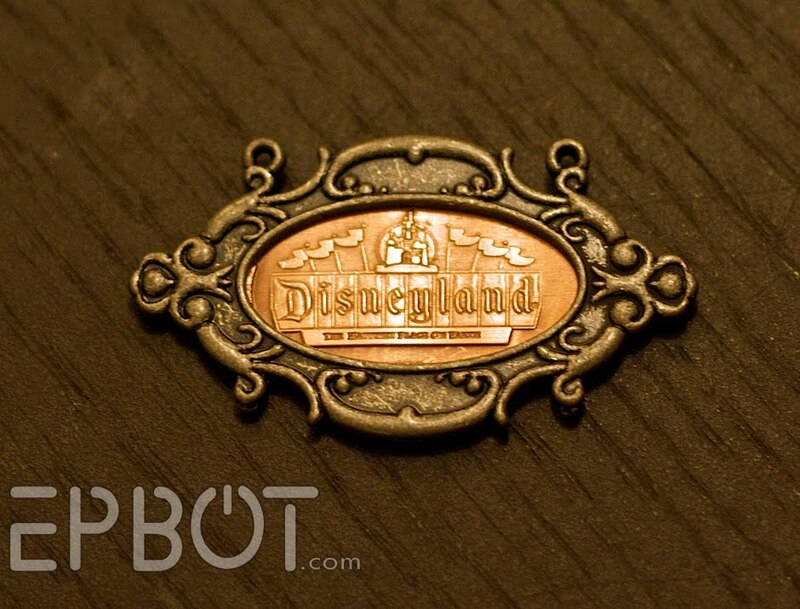 Maybe I'l actually smash some pennies the next time I'm in WDW and do something like this. Oh my gosh, I cannot tell you how happy this makes me! I have tons of these smashed pennies from childhood vacations (and uh, it's rumored I might still be collecting them.) I've thought of turning them into charms by way of your first method for a while now, but I wasn't sure I would actually wear a charm bracelet of that style. I am *in love* with the idea of using the oval charm holders. Tomorrow I will have to scour my local Joann's and Michaels to see if they have any of those items left on clearance. I loved all the ideas and can't wait to make some jewelry out of my pennies now! So cute and fun! I'm going to have to get some smashed pennies when I come home to the U.S.
Ohmigosh! You are sooo creative! My creativity bows in submission to your creative juices!! I LOVE LOVE LOVE all your jewelry! Keep up the good work and the tips are very helpful! Wow, I wish I had smashed pennies! About Dumbo, agreed on the business and discordance of him on the necklace. Though I do like the circus theme. But he's just gets lost in all that faboo. About seahorse. I put my thumb over the bottom leaf and I think it's missing something without anything hanging there. I don't like the leaf but perhaps a small charm? Shell? Fork? Jewel? Man, I wonder if I can buy unwanted smashed pennies...or buy a penny smashing machine. Also, those are stunning and Disney fans everywhere would be all over buying them. SO COOL! What a fabulous idea! I have a ton of this stuff, too. What kind of lacquer do you use on the polished pennies? I love the polished look. Thsnk you so much for sharing!! I love your jewelry and your pennies. In my opinion the penny looks good with the black chain. I also like the seahorse with all the dangles around it and under it, don't change it! an easy way to stop ribbon fraying is running clear nailpolish down the edge, it's easy and cheap! These ideas are brilliant! I collect those flattened pennies (yes, I'm a nerd), and this would be a great use for them. I love it! Now I know what to do with the multitude of pressed pennies I have from Disneyland, WDW, and a bunch of other places! Your pieces are fabulous and so inventive! I just wanted to chime in with a glue recommendation. I've used E6000 with great success. It glues anything to anything else. I did a repair on a bracelet gluing some sterling wire to a sterling piece in order to make loops on a bracelet and used E6000. I ran into the lady 2 years later and it was still holding. I am so inspired! I am not a really crafty person, but I have a smashed penny that I got on my honeymoon that I want to do more with than just have it sitting in a jar somewhere. Thanks for the great idea! I like the seahorse necklace as is. I would take the Dumbo charm off the necklace, though, and make it into two. Those are all truly fabulous. I also vote for keeping the seaweed dangle. Some friends of mine are really into steampunk and have great steampunk costumes, and one had a link to the site on his, so when I saw it, I thought of you! It has all kinds of random steampunk stuff. I love the seahorse necklace and the dangle looks perfect. Are you going to use wire to suspend the penny in between? I can't wait to find out!!!! Yay! Oh I went to a Steampunk Bizzare in Hartford,CT and it was pretty cool. They are doing them annually and hopefully next year there will be more room and more artists and then I will get more pictures. Thank you for always being awesome. I think I like the seahorse with the dangly. It just enhances the seaweed effect. 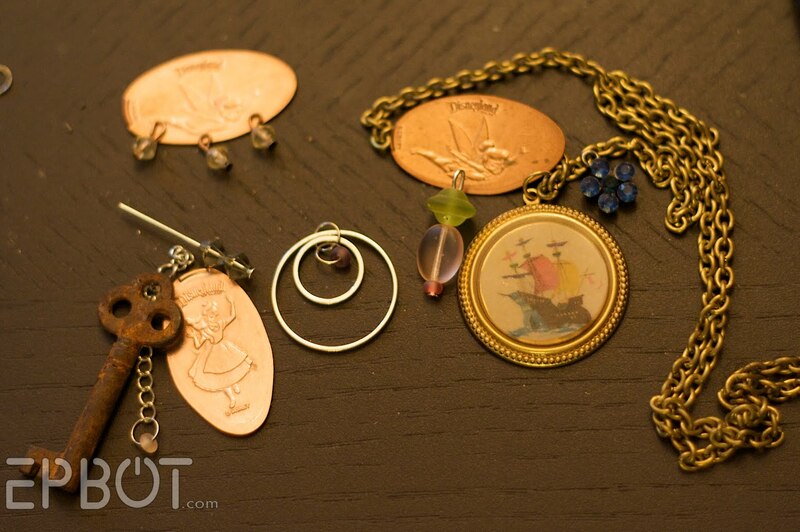 I also love the Tink/pirate ship necklace. The positioning of Tink was inspired. I love how it looks like she's flying away. You need to open an etsy store! 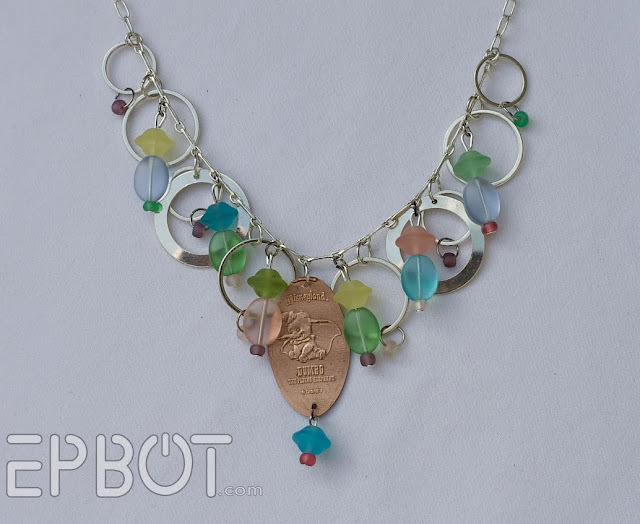 Sets of the penny buttons would be awesome, and the jewelry is too cute! I never did the smashed penny thing but it would make such a cute charm bracelet. I'm going to start collecting them, maybe after a couple years I'll have a whole bracelet. I think your crafty posts are my favorite part of epbot. Your crafty and thrify- the greatest combination ever! Well, now I know what all the teenagers in my family are getting for Christmas. Question: How did you fasten the cuff? I am dying to know because I'm not creative enough to figure it out on my own. 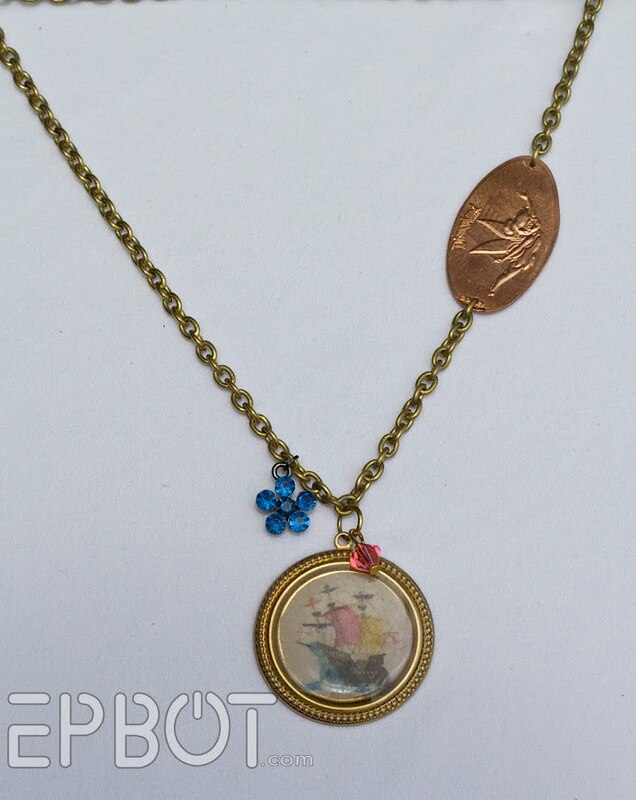 LOVE the Tinkerbell/Pirate Ship necklace that you did! I think the Alice penny would be splendid with the dark necklace if the penny was tarnished, but with it all shiny, it just doesn't look right. Is there any way you can "age" it? Wow, these are gorgeous. I'd love to see an Etsy store as well. HOLY CRAP! 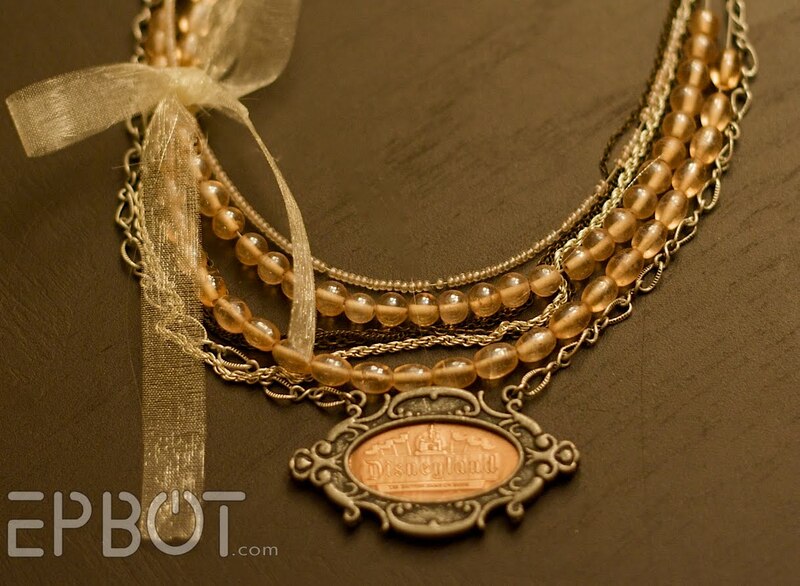 I am in love love love love love love with the Alice penny. She is my favorite Disney character of all time. I think the design you had was perfect, although I think the 'wonder' letters may be a bit too obvious. If someone doesn't realize that she is Alice In Wonderland, then they don't deserve to know. Maybe use Alice as part of a bracelet? Use the letters on either side of her, throw in a question mark, a hat, teacup, cat, etc. A Pandora bead-inspired charm bracelet where the only dangle is Alice but the other parts are "charms" as well...telling her story. Fan-freakin'-tastic! Using the frames was ingenious! I love smashed pennies and get them everywhere I go. And I absolutely LOVE the idea of making them into something I could wear and enjoy all the time, instead of just keeping them in the little books. I want to go home right now and start making some of these. Very, very cool and inspiring! Just when I thought I'd put away my jewelry making supplies for good, you post this! I'm going to have to start carrying pennies with me where ever I go now! I love the seaweed dangle (personally) but if it feels too much for you, lose it. There's nothing worse than making a piece of jewelry that you'll never wear. As for Alice, I think the black chain would work nicely if you age the penny (liver of sulfur or something similar) and polish Alice a bit to make her stand out. Just a thought. Love, love, love all of them! You truly have the most amazing ideas! I love elongated pennnies!! we were just at Disneyland this weekend and got a few more. Thanks for a fresh perspective and clever idea! I hope that you read late comments from this post! Steampunk dining room, two amazing and hilarious blogs, twitter-stalking, incredible craft-making, the CW book...when exactly do you have time to absorb all the movies, TV shows, books, conventions, and theme parks you so cleverly reference? Ok, my obsessive tendencies are starting to creep out. And next time I'm going to Disneyland, you better believe I'm taking this checklist with me! On the copper/black combination - couldn't you add a black patina to the penny to tie it together? And, ETSY! I'd buy some of these from you! Loved the smashed penny jewelry -- have been wanting to do something with my collection for years. Safety glasses are a good tip, but if you don't have ready access, whenever you need to do something with a high chance of parts flying, put your hands and tools inside a large ziplock bag -- stuff can't fly all over and you can still see what you're doing! I absolutely love the bracelet! Now I just need to go somewhere to get a smashed penny so I can make one. 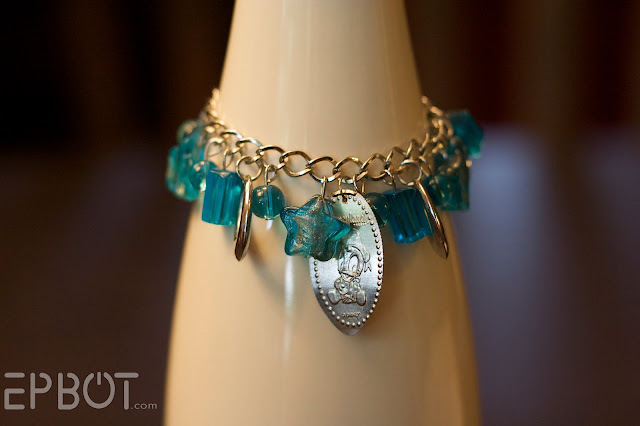 I've never been into collecting smashed pennies, but that bracelet is so cool, I just have to try it! And I agree with those who say to leave the dangle on the seahorse. And the Tinkerbell with the pirate ship is so adorable! These are so pretty! And *now* I get it; honestly , our "skipper" on the Jungle Cruise at Disney was actually quite hilarious (spare many bad puns) and I was laughing so hard I wondered how I would get off of the boat. You just have to have a great personality and a good sense of humor for that job...hmmm...sounds like somebody I know! :) LOL Finally, it's all connected. And if you made an Etsy store, you might be a millionaire! gee, I've got some oval jewelry blanks. I'll have to get out the pennies. I always knew that someday, somewhere, somebody would be able to tell me how to make jewlry out my Disney pennies and other thingies.! I can't thank you enough. THANK YOU THANK YOU THANK YOU THANK YOU THANK YOU THANK YOU THANK YOU THANK YOU THANK YOU THANK YOU THANK YOU THANK YOU THANK YOU THANK YOU THANK YOU THANK YOU THANK YOU THANK YOU THANK YOU THANK YOU THANK YOU THANK YOU THANK YOU THANK YOU multiplied by 36,789,293,047! This is awesome. I made a smashed penny choker (hand pulled copper wire o rings in between each one) in jewelry class (circa 1997) from smashed pennies I collected while in Scotland. It was my favorite piece, but not the greatest craftmanship (I was just learning!) I have been saving pennies ever since wanting to improve it, but wasn't quite sure where to start. This has given me some great ideas and inspired me to not give up! THanks! I just got back from a trip thru CO and UT and smashed pennies as I went at the parks, etc. Great ideas! Thanks! I have a jar with these in and now I think I will go look thru them and see what I want to wear! finally a great reason to smash pennies...evil laughter! Seriously though..adorable. As an annual passholder i refrained from the penny machines..cuz really what are you going to do with them...and now "plenty of things" is the answer! I want to commission you to turn my pennies into fabulous things. I just don't have the vision that you do. I'm definitely going to add a penny to my charm bracelet though. My husband found a smooshed quarter machine for the first time. I argued with him that we had to get the penny instead because you had promised to show us what to do with our smooshed pennies. In the end we got both; he'll be thrilled that we made the right choice. But now I think we'll need to get two of everything: one to scrapbook, one to play with. Ooh I wish my Disney pennies were as cool as yours. I need to go back. Leave the dangle on the seahorse penny necklace. Love it! I love this idea! I am also a smashed penny collector, and never thought of any use for them! This is GREAT! Totally love these ideas; although we don't have smashed pennys here in Australia I could certainly find other items to create great jewellery with these techniques! i like ur smashed penny jewelry. thanks for posting! SQUEE! These are BEAUTIFUL! I am so going to try to do the leather bracelet one. I LOVE the seahorse - just as it is. Love the stuff you've done. I vote for the seaweed looking with dangle around the seahorse penny, but you may be right about making it into a brooch. You mentioned you used to make book purses, and as a total book worm I must ask, how?! Oh, please, do another show and tell with more of penny jewelry, book purses, and whatever your creative mind comes up with next!!! So I collect smashed pennies. I also make jewelry. I NEVER have thought to combine the two. Thanks for the post! OMG, Jen! I'm so impressed with your craftiness! I wish I had your genius for this stuff. Thanks for the tips and the awesome ideas. I loved your dining room posts too! I am ridiculously excited about this. I have a bunch of pressed pennies from random museums and parks. I haven't had any idea of what to do with them. This is quite possibly the BEST THING I'VE EVER SEEN! I know I'll be making a ton of these when I start working at Disney soon, and this will be a great way to display them. I really admire people like you and the other "crafty" people who have submitted comments. I have not one crafty bone in my body--I look at your directions and say, "nope, too many steps!" Maybe it's lack of patience. But it's NOT lack of appreciation. I love reading these posts; just wish I had the wherewithal to do anything like this! Keep on creating, Crafty People! Would you be interested in selling any of these pieces? It has locations and pictures and tips for preparing the pennies and everything. Hey, Jen, how 'bout you and me do a Sea World penny trip and make some jewelry? 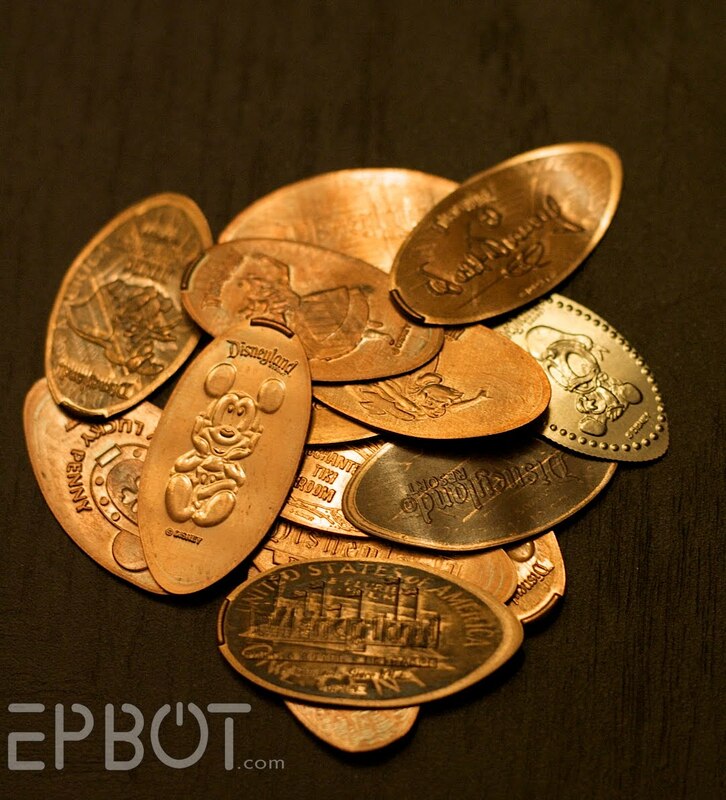 I need to go to Disney just so I can get more smashed pennies!! I love the steampunk vibe of the stuff you've made! These are fabulous! I will be looking at those little souvenirs in a whole new light. Any ideas on creative displays for lots of pennies? This is a great idea! I collect pins in the parks but have only gotten a few smashed pennies. I always carry my pluto penny for luck. Now that I've seen your work I might use my jewelry making skills to create some magical vacation memories. You mentioned smashed dimes and quarters. I've never seen a machine that does anything other than pennies in the parks. Can I put a dime in the penny machines??? OMGoodness, Jen!! Thank you, thank you, thank you!! I am a huge smashed penny fan...my husband and I made one on our first date, so they've become quite a tradition for us! We move a lot because he's in the military, so we get to travel quite a bit and I have A LOT of these pennies! You have given some BEAUTIFUL ideas for making these even more special! I seriously love your Geek Chic-ness!! Awesome ideas! These turned out great. Now I know what to do with the few smashed pennies that I still have here. Should be fun to play around! I love these! If you'd like to see the necklace with amber beads, I'm your taker! That is so cool that the pennies fit perfectly into those frames! 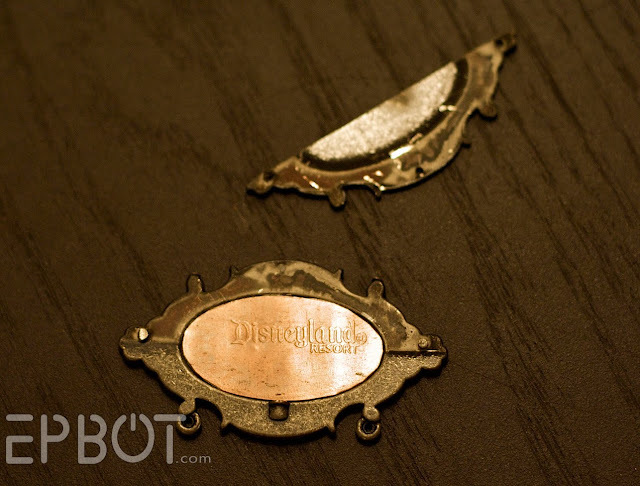 If I can find a penny smasher around here, I might have to try my hand at making some jewelry using them - these are neat! love this post! i'm always trying new crafts, have done a bit of jewelry and think i need to try this. i only have i think 2 smashed pennies at home. How do you do the drilling? I'm down with all the other stuff. It's the drilling that gives the the doggie-with-the-cocked-ear-huh?-look. Jen, I'm a huge fan of this project. 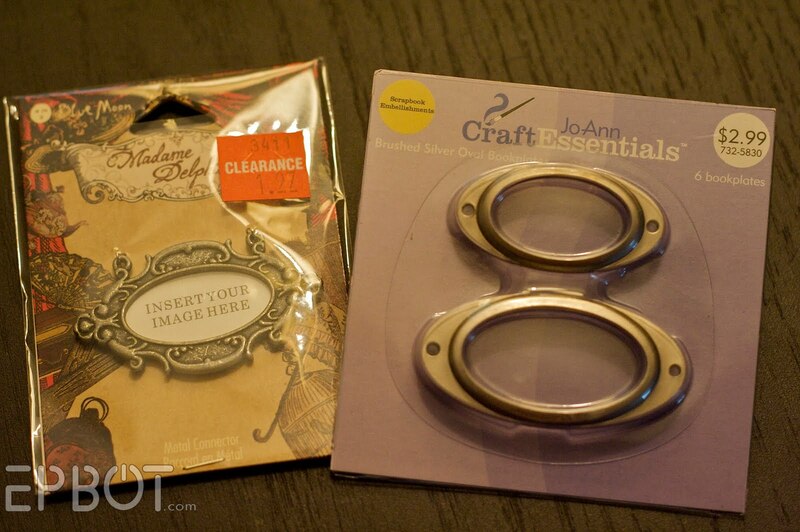 I've been on the hunt for those little frames, but sadly JoAnn's has discontinued them. I've searched for suitable replacements, but am having no luck. I have a penny stamped with "Something old, something new Something borrowed, something blue And a lucky sixpence in her shoe" to give to my best friend for her wedding day. I am really hoping to be able to turn it into this great cuff bracelet. Do you have any suggestions of what to use (and where I could get it) to accomplish the same thing since JoAnn isn't coming through for me? Hey, Jen, these are amazing! What a fantastic idea!! I have a Disneyland blog where I'd love to put a link to your project page-- would you mind? Of course not, Jenn, link away! And thanks! Thank you! And again, great idea, I'm so excited to get pennies next time I'm there. You are (as usual) a bad influence. I live in San Diego, and have an AP, so I have begun collecting the smashed coins. In 12 hours on a single day I collected close to 100 smashed coins, was frustrated by at least 7 out of order machines, and was too late (locked away due to fireworks) for 3 machines. This was just in Disneyland! I did not make it across the courtyard to CA Adv at all. I was reading your Sparklies post and this link was at the bottom. I'd forgotten that I was going to ask you if you've seen those little frames anywhere since you posted as I've been looking for them for months. I live in Phoenix so there are plenty of craft stores but I haven't seen the frames anywhere yet and I can't locate them on the internet. I have a pressed penny from my honeymoon in 1991 to San Francisco just sitting in a box waiting to be made into a necklace... Ideas? @ Laura - check my FAQ page; there are links there to the frames on Amazon and another craft site. love the sea horse necklace... when I go to Disneyworld now because I just can't wait to make jewelry like yours! Please update when you finish the others. Okay, for people looking for how to smash a penny without a machine... When I was a kid, my friend and I lived by a train track... Put penny or quarter or whatever on the track.. Wait for train... Then start your hunt... Because usually it gets flug 20 or so feet from where it started. It won't derail the train... So don't worry, but it works. Just now saw this. Love love love love love!!!! wow, these are gorgeous! You mentioned smashed dimes and quarters. I've never seen a machine that does anything other than pennies in the parks. I'm a squished penny collector, but after a while, the plastic storage things get boring. I love your ideas. the website www.pennycollector.com has great info for those new to the hobby, including lists of locations of the machines. Those are awesome. Just wanted to drop a suggestion. If you use older (pre 1982) pennies your piece will be pure copper (so no silvery streaks) and a bit thicker. Newer pennies are copper coated zinc which is softer. Went to WDW last week and loaded up on smashed pennies and quarters! Still wondering how you finished and fastened the leather cuff though. Any tips? I've been going crazy! I wanted to make the pirate cuff...I've been to nine different stores looking for an oval frame to use...nothing! So frustrating! Any help with locating a supplier would be AWESOME! This is seriously amazing, my boyfriend and I always collect pennies from the trips we go on, and I love the idea of picking out my favorites to make beautiful jewerly. Thanks for the tips and ideas! These are adorable! Also, to stop ravelly ribbon from ravelling you can melt the ends on a candle.... not too close to the flame obviously. I cannot find these frame/bookplate pieces ANYWHERE. Anyone have any hints? I want to find some really bad! Jen, if you check my FAQ page, there are a few links in there. Hope that helps! I really, really, REALLY want to see the Alice in Wonderland piece!!! I wish I could find a necklace that looked like seaweed also, because I have a smashed penny with a lighthouse from Tybee Island and that would be perfect! Thanks for the ideas!! I could not find the little oval frames at Joann's or Micheal's. Has anyone been able to find them elsewhere? I would love to make a cuff with some of the smashed pennies I've collected over the years! Genius. Seriously. I was wondering what we could do with these!! Thank you so much for the inspiration!! 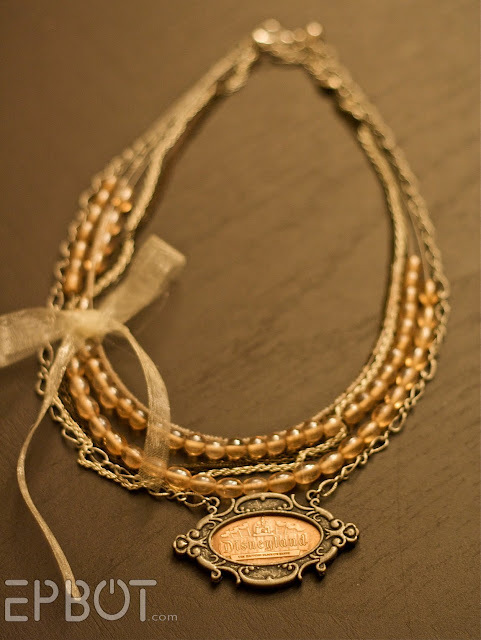 Found your page through Pinterest and I couldn't resist leaving a comment to tell you how much I love this smashed penny jewelry post! I have a compartment in my jewelry box full of smashed pennies. I love making them at the various places we visit, but never even see them once we get home and they go in the box. I love the little frames you found and I can envision a shadow box with a cute background to display them in! I don't wear much jewelry but the pieces you made are just darling and they look natural, like the penny was always supposed to be there. Great work! I saw in some earlier comments that some people were having trouble finding frames for their pennies so I wanted to add this link, I found some gorgeous oval bookplates on Joann.com. I hope this is helpful! I know where I'll be making a stop tomorrow! This is awesome! I just got back from a week at Disney. Prior to leaving, I got a roll of quarters and a roll of uncirculated pennies from the bank. My plan was to collect smashed pennies with my 3 y/o. We had fun, but I had no idea how many machines there really are at Disney! I bought the smashed penny display folder, but now I may be tempted to raid it. No luck on finding the oval frames. All the links on the FAQ page are out of stock. I just checked Joann.com and didn't see anything, I don't know where Bridgett L saw them. Bummer. Great job on the tutorials! Very well planned, shot, and written. 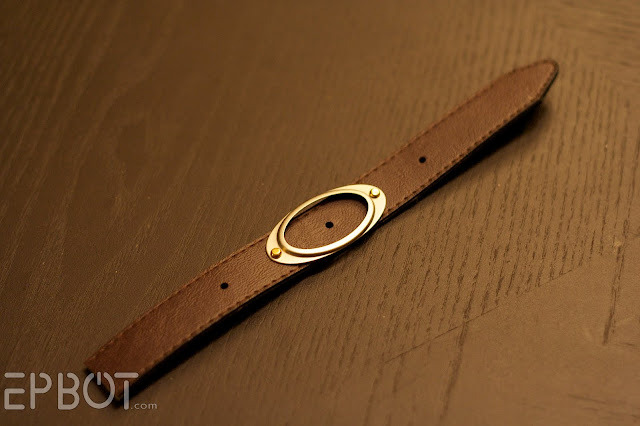 My only question is - how did you close/clasp the leather wrist bands? I singe the cut edges of my ribbons, especially sheer ribbons, with a lighter. 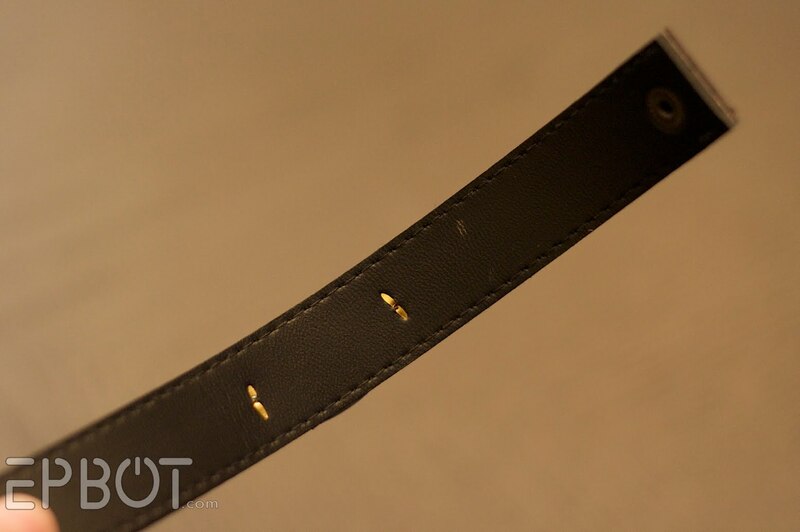 It "seals" the edge well enough to use the ribbon in jewelry without hemming it. I fix the edges of book ribbons that way, too. Oh my goodness! I have the hugest collection of 'squished pennies' and am always wondering how I can display them! Thanks for all the wonderful ideas!!! Hi! I just found your blog today & have been devouring all of the posts, tutorials & ideas (oh my!) on here, just having a ball! Anyway, I had to chime in here & say, 'Keep the dangle!" It really makes it look like the seaweed is flowing under the water (ohmagosh I'm a geek! I just caught myself swaying back & forth as if you could see me demonstrating how the seaweed looks...hee hee hee...alrighty then, back to the post). I think it's so pretty & unusual, which to me is a must. I just hate it when you get something new & go somewhere & see 5 other people wearing it too....ick! Anyway, I had to write & tell you how absolutely AWESOME I think your blog is & what an amazing imagination you have. I have been inspired & have stuff strewn all over my bed, much to my hubby's chagrin (hee hee hee....That's how I know that he loves me though....he just sighs, shakes his head & says, "Just let me know when I can get in bed." Bless his heart. Thank you so much for taking time out to entertain & inspire us all out here in craftyland, I know I have a million new ideas & can't wait to get started. Thanks again & have a blessed day! Also just found your craftiness blog, and LOVE it!! I have a coin purse full of smashed pennies waiting to go onto perhaps a bellydancing/harem girl costume, but I like these better. Since 1982, american pennies have been made with a zinc core covered with copper. In my high school chemistry class, we did a little experiment where we took an older penny and a newer penny, filed notches in the edges, and left both in a HCl solution overnight. In the morning, we still had an old all-copper penny, and a new penny shell, because the hydrochloric acid ate the zinc and not the copper. Since then, when I have gone on vacations to touristy stops that may have penny smashers, I make sure to have old pennies, because I want a good patina on my keepsake, rather than a silvery core. The Oregon aquarium in Newport has (had? don't know if it's still there) a quarter smasher, and I got several of those, in case you're in the area! Fire Mountain Gems has a nifty little hole punch device that will slowly screw down and punch a hole (1.5 or 2mm) in most metals up to 3mm in thickness. I've used it on lots of flat discy things that needed an extra hole for drops or chain points. [ http://www.firemountaingems.com/itemdetails/H203084TL ] I have a dremel too, and I love it, but for little bitty projects on my jewelry table this is easier for me. Amazing! I was wondering what to do with all our smashed pennies! Love your tutes! Great website! Is that you? Are you that? Errr, them? LOL, you know what I mean... after all, how many cats - named Tonk - eat ribbon, and have such creative parents? Dang, and all this time, I've just been sticking them into a little collector's book.